For Christmas this year I would like a pink pony with a crown, a unicorn blanket, sparkle shoes, and a stick horse. 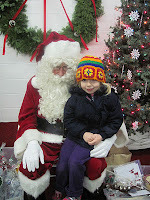 Just in case she was too shy to tell Santa in person, Lola asked me to write her wishes in a Christmas card for Santa. She insisted on a Christmas card, not just any ordinary note card. She also wanted to bring Santa a present. We chose one of the felt heart ornaments we made. I am so proud that my daughter thinks to bring Santa Claus a present when she goes to visit him. She is thoughtful and kind like that. Tell that sweet girl that she is welcome to adopt Trigger, the stick horse at our house. He is very lonesome and needs some TLC. Of course she might prefer Santa's more updated version.